← Are you ready to test yourself? One of the world’s most amazing love stories, happened on a mountain in China. In a country where a man’s marriageability hinges on whether he owns an apartment, and mistresses act as a status symbol for the rich and powerful, it is not surprising that Chinese have become enchanted by a story of love at its purest and most humble. How many people in contemporary China—or anywhere else—would give up everything they have to be with the one they love? More than 50 year ago, Xu Chaoqing (徐朝清) and Liu Guojiang (刘国江) chose exactly that. Were Xu and Liu to meet today, they would face far fewer obstacles. But in 1956, Xu was a widow with four children, while Liu was ten years younger than she. Criticism and gossip drove the couple to escape their village and start a new, arduous life high up in the mountains, in what is now southwestern Chongqing. Not until 2001 did they come to the world’s attention again. A research team on expedition discovered a series of more than 6,000 steps carved into the steep mountainside. The stairs led the researchers to the couple, wrinkled by time but still very much in love. These 6,000 steps were Liu’s great work of love: He carved them painstakingly by hand, in an effort spanning decades, so that his wife could safely ascend and descend the mountain. The Ladder of Love (爱情天梯) has since become well-known throughout China, inspiring television and movie adaptations, even as Xu and Liu maintained their simple mountain life. He called her his “old lady”; he was still her “young man” after all these years. Liu continued caring for his Ladder of Love until his death in 2007, at the age of 72. Xu passed away on October 30, 2012, bringing to a close a love story that began one day in June of 1942. Liu Guojiang was just six years old then, outside catching crickets when a wedding procession entered his village, a place called Gaotan. Local custom held that it was good luck for children who lost their baby teeth to have a bride touch the inside of their mouth, so gap-toothed Liu approached the palanquin. He was nervous, and bit the bride’s finger. The curtain lifted to reveal a beautiful, sixteen-year old girl staring at him with a trace of anger. “Little rascal, when you grow up, you should find a pretty girl like this!” joked a nearby woman. Later, when people asked him what kind of wife he wanted, he told them earnestly that he wanted someone like that girl. That girl was Xu Chaoqing, who had just married into the richest family in Liu’s village. But 10 years later, her husband was dead of meningitis, and she found herself penniless with four children, the youngest just one year old. Indigent, Xu and her children survived on wild mushrooms gathered from the woods. They could not even afford salt to season them. She wove grass sandals to sell, one pair for five pennies. One evening, Xu went to fetch water from the village river, carrying her youngest child on her back. In the dwindling light, Xu slipped, and they plunged into the river. Liu, who lived nearby, jumped in to save them both. Liu had been aware of the family’s poverty, but as a stranger, he had been in no place to intervene. Now, he had his chance. After rescuing Xu, Liu helped them with all the heavy chores: Fetching water, chopping firewood, planting crops. Three years passed, and Liu’s close relationship with Xu became the target of malicious tongues. Girls came by to scold Liu, telling him not to waste time with a widow. Xu’s in-laws were not pleased either. One day in 1956, the pressure grew too intense and Xu told Liu to stop his visits. That night, he snuck into her house to propose. The next morning, Liu, Xu, and her children disappeared from Gaotan Village forever. 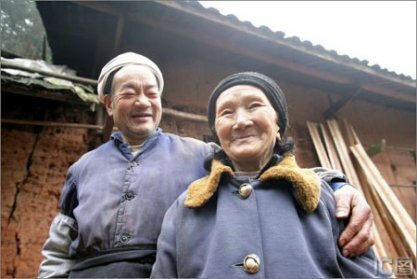 Xu and Liu started their life in the mountains in an abandoned straw hut. They caught fish, gathered wild vegetables, walnuts, and dates, and ground leaves into flour. Behind their hut, they planted sweet potatoes and corn, though hungry monkeys were always eager for a share of the harvest. To fend off storms and wild beasts—even tigers—the couple built a sturdier shelter. It took them more than a year to retrieve enough mud and clay from a mountain pass, and another year to fire their own tiles from a homemade kiln. Xu gave birth to four of Liu’s children high in those mountains with no medical assistance. Her youngest child from her first marriage died, but her remaining seven children—four by Liu, three by Xu’s first husband—grew up and went to school in the world below. The couple occasionally traveled to a village market to sell honey and buy goods. But they remained adamant about continuing their mountain life, even as their children settled down in the outside world. A tiny, steep trail provided the only link between their hideout and the world below. 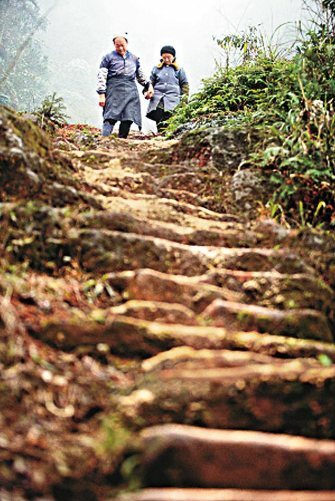 Though the couple’s trips out into the world were rare, Liu worried about his wife’s safety and began to hand-carve a stairway in the mountain. Over 57 years, he broke 36 steel chisels as he built 6,000 steps. “I was worried for him, but he said, when the stairs are built, it will be easy for me to climb down. But in my life I’ve hardly gone down the mountain at all,” Xu said in a 2006 interview. This entry was posted in Uncategorized and tagged china, devotion, eros, happiness, love, man carves stairs, marriage, minority, special, stairway to heaven, story, unconventional. Bookmark the permalink. Pingback: 4:26 am. And Inspired. – Lead.Learn.Live.